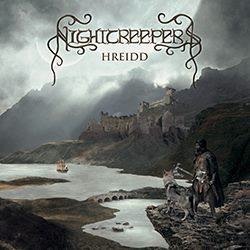 French folk metallers NightCreepers will soon release their third full-length album, entitled “Hreidd“. The band was formed in 2006 and after 2 EPs they released their debut album “Svingeheim” in 2009. Their next full-length was released 3 years later, in 2012, entitled “Alpha“. If everything goes as planned, the new album will be self-released on November 2014 and it will available directly in their official page’s e-shop. NightCreepers have just unveiled the album tracklist, the cover artwork done by Raphaelle Monvoisin, as well as a new video teaser that you can watch below. According to the band “the concept of “Hreidd” is pretty much based on the idea of choosing the path which fits both your destination and the actual person you are. It still takes place in the world of Svingeheim that we created since the beginning of our journey, but we’ve strengthened the notion of avoiding acts and facts that betray yourself from the inner. It’s a word of motivation and positiveness to become truly ourselves but also, this often means going through a lot of pain and delusions“.